A lot of people will be talking about the weather today. But we’ll be talking about a cheese cart. Oh, hi. Glad you could join us. 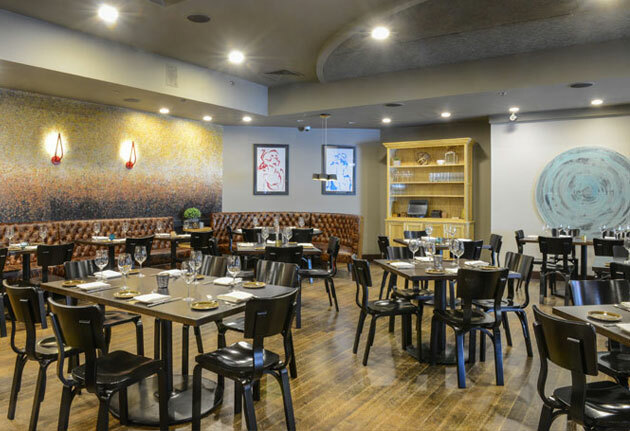 We call this one Study, a splendid little room attached to the Ames Street Deli that serves 13-course dinners and cheese on wheels, now open in Kendall Square. First, there was Ames Street Deli. Now, there’s this. They share the same building and the same owners, and have only a wall between them. They also share an affinity for industrial minimalism broken by huge moss-covered pillars and copper-colored hanging sheets. Your choice: four courses or 13. That second option is great for when you want squid-ink gnocchi, lamb tartare topped with uni and 11 other things that you can see on this menu. Their cheese cart is fully operational. If you chose four courses, a cheese cart will park at your table before dessert. There, it will tempt you with soft Spanish sheep’s cheese, cloth-wrapped pecorino and pumpkin-spice jam. Something beautiful happens if you ask for the Sherry Shebang. They pour you an ounce of every sherry on the list. That only works here, by the way.